But more important than the number of words are the stories of lives changed. People in more than 20 nations have joined on Facebook and have commented along the way. Blog posts in Spanish are beginning to find impact in the lives the growing number of Spanish speakers using Beliefnet.com. 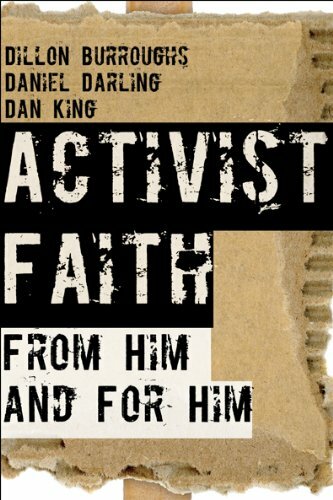 Of course, the Activist Faith book published this month by Navpress also marks a transition from “blog only” to a wide-ranging movement connecting with new readers in new ways. She responds simply, “Now I have some extra money to buy things for my kids.” She has three young children under the age of ten. This is a response that I can really relate to! Activist Faith provides an array of possibilities for faith to flow outward naturally to helping meet people’s needs and in so doing being a witness to them. This book is thoughtful, practical and a veritable treasure chest of information for anyone who is seeking to follow Jesus into the real world, where real people with real problems live and suffer. None of us can do everything that needs to be done. But all of us can do something. And this book is a helpful guide to discovering what your something might be. Activist Faith is not about any one person, but about you and me and those we connect with impacting lives in tangible, meaningful ways. If you haven’t picked up a copy of the book, you’ll find ways to make a greater difference with you own life, discovering purpose and meaning as you tackle today’s issues with God’s love. And when you help change a life, don’t keep it a secret–share it! We’d love to tell your story at Activist Faith. To share your story, submit details here. You could just be the next story that inspires change featured at Activist Faith. Dillon Burroughs is an author, activist, and founding partner of Activist Faith. His latest book, Activist Faith, addresses 12 key social issues and how people of faith are stepping up to make a difference. Find out more and get involved at ActivistFaith.org.